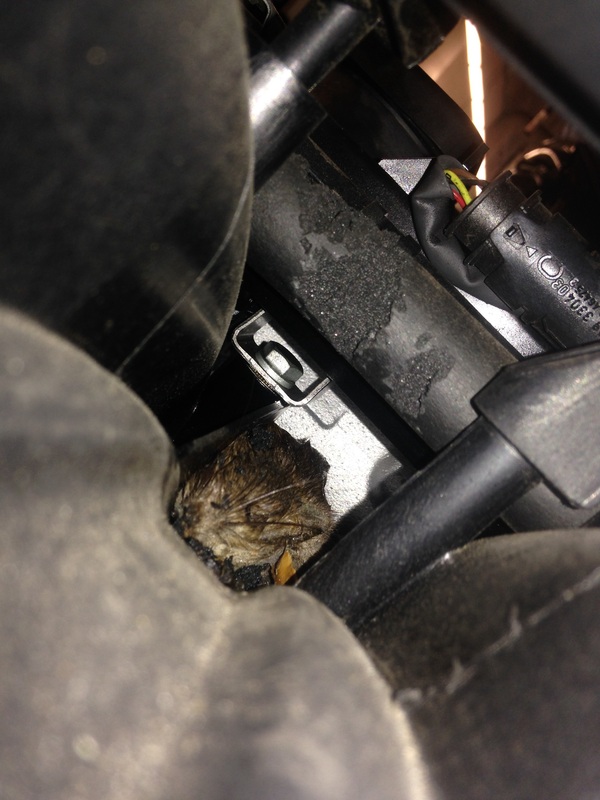 Interesting picture,,,,this is a picture of a little mouse that died causing a lot of problems,,,,the car isa E46,,,,the car first went to a independent repair shop for a misfire,,,,the independent shop found cylinder 3 had a permanent misfire,,,,the independent tells the customer is a problem with the DME,,,,,,so the customer replaced the DME for $1000 plus dollars,,,,and the problem was still there,,,,,so now the the car ends up with us at the dealer,,,,,so we check the faults and found cylinder 3 misfire,,,,so we checked the spark plugs and coils,,,noticed the spark plug was white and very dry,,,,like no fuel,,,,,,so we checked the fuel injector when we found are little mouse had chewed the wiring harness for the fuel injector. This entry was posted in Uncategorized and tagged DME, E46, Fuel injector, Mouse. Bookmark the permalink.